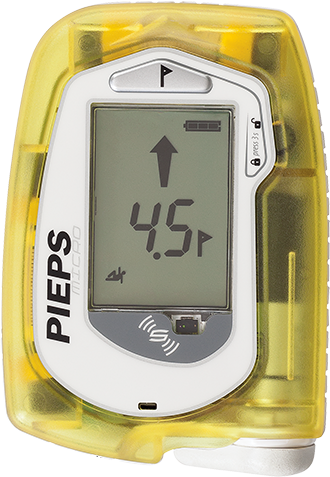 Summary: The Pieps Micro is the smallest and lightest avalanche transceiver—it will undoubtedly be a favorite of the Lycra-clad weight-watchers. The Micro has a unique proximity sensor that automatically changes between searching and transmitting based on whether the transceiver is in its harness or your hand. The proximity sensor is a cool concept, but in practice it has the potential to complicate, rather than simplify, the transceiver. Searching: The Micro's reception range is excellent. As with the Pieps DSP Sport and Pieps DSP Pro, the Micro's perpendicular reception range was outstanding. (In my testing the Micro's range was almost identical to the Pieps DSP Sport and DSP Pro, although in the reception range chart the Micro appears to be better because it was tested during only one test session when all beacons had long ranges.) Although the user manual says the recommended search strip width is 40m, Pieps assures me the recommended width is 50 meters. We suggest a search strip width of no more than 30 meters (100 feet) even with the Micro. As with the Pieps DSP Sport and DSP Pro, the Micro's directional indicator senses and displays changes in direction almost immediately. The older DSPs were a little sluggish compared to the newer Pieps. The Micro vibrates briefly when it first receives a signal. 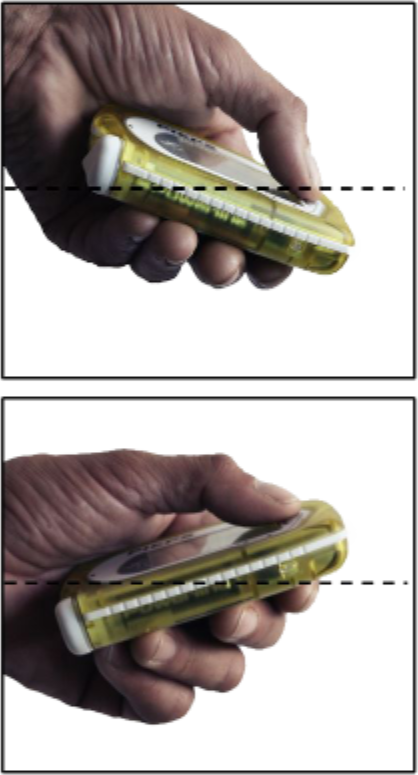 Tactile feedback is a novel idea that could have value, but if you're skiing, scared, or wearing bulky gloves, it is unlikely you will notice the Micro's gentle vibration. Compared to the Pieps DSP Sport/Pro and the ear-piercingly loud ARVA Neo, the Micro's audio output is relatively quiet. Multiple Burials: You can mark multiple burials using the same technique as the Pieps DSP Sport and DSP Pro—pressing the Flag button momentarily ignores the closest transmitter and advances to the next. 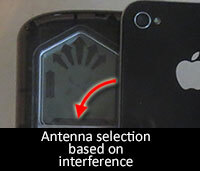 This first illustration shows the Micro indicating that there are two transmitting beacons (i.e., the two stick figures at the bottom of the display) and that you are close enough to mark the nearest transceiver (i.e., the small flag). After pressing the Flag button, the second illustration shows that one of the transmitters is now being ignored (i.e., there is a box around the first stick figure) and the transceiver now shows the distance and direction to the next transmitter. This process is clean and intuitive. It worked very well in my minimal testing. In the unlikely event that you want to unmark a previously marked transceiver, you'll need to toggle the power off and on. Spikes: Although the Micro creates a slightly larger "bracketed box" during the fine search than some other transceivers, its spike handling is excellent. Auto-Revert: The Pieps Micro automatically changes from searching to transmitting (i.e., "reverts to transmitting") after one minute without motion (a customization option allows you to change this time period between 60, 90, and 120 seconds). Before returning to transmitting, the Micro blinks "AR" (for auto-revert) on the display and beeps for 30 seconds. You can prevent the automatic switching to transmitting by pressing the Flag button or by moving the transmitter so it senses motion. After the Micro automatically returns to transmit mode, it will continue to beep until you press-and-hold the Flag button for three seconds. When you do press and hold the Flag button for three seconds, you will be returned to search mode. You will need to again press and hold the Flag button for three seconds to unlock the search mode (the padlock will disappear) at which point you will need to stow the device (i.e., which covers the proximity sensor) to return to normal (non-beeping) transmit mode. Note that you cannot disable the Micro's revert-to-transmit behavior. It is understandable why Pieps made this decision, because without a switch to change between searching and transmitting, it would be easy to stow the Micro in its harness and not be transmitting. However, not being able to disable the revert to transmit is a very different approach for Pieps (the auto-revert feature on the Pieps DSP Sport and Pieps DSP Pro can be enabled only at a service center). Transmitting: As with the Pieps DSP Sport and DSP Pro, the Micro will transmit on the shorter (i.e., x-axis) antenna if the primary antenna senses interference with other electronics (e.g., a cell phone) or if the primary antenna is damaged. You can test this by waking up your smartphone (you don't need to be on a phone call) and holding your phone next to your transmitting Micro as shown in this picture of a Pieps DSP Pro (although on the Micro, hold your phone near the left-side of the transceiver). The display should then show that the shorter antenna is transmitting. Group Check: You can enable the Pieps Micro's "group check" mode by turning the Micro on, waiting until the four silhouettes are displayed, and then pressing and holding the Flag button. While the button is pressed, the Micro will display either "CH" (which means it is ready to CHeck a transceiver), the distance to a properly transmitting transceiver that is within one meter (e.g., "0.6"), or "ER" if there is a problem with the transmitter. The Micro will remain in group check mode until you release the Flag button (if you release the button unintentionally, you can press it again within a few seconds to return to group check mode). Two customizable settings affect the group check mode. You can chose to do a "regular group check" which checks the existence of a signal and its frequency, or an "extended group check" that also checks the signal duration. When the regular group check mode is enabled, the non-intuitive letters "CF" appear in the upper portion of the screen (for "Check Fast"). The letters "CE" appear when doing an extended group check (for "Check Extended"). You can also enable a "professional group check mode." In this mode, the device searches for and tests transceivers when it is tipped upwards, and it transmits a signal when tipped downward (see photos). This lets you quickly check that your partner (or client) is both transmitting and receiving without stowing your transceiver (since stowing and retrieving your transceiver is how you toggle the Micro between transmitting and searching). It would be extremely confusing if you unexpectedly used a Micro that had this mode enabled (although this mode can only be enabled using the Pieps app). To me, the "professional group check mode" seems like a workaround that was added to accommodate the fact that there isn't a switch to quickly change between searching and transmitting. You turn on your Micro at the trailhead and it starts searching. In order to have your partner check that you are transmitting, you stow your Micro. Your partner checks that you are transmitting. You take your transceiver out and it automatically begins searching (by design). You confirm that your partner is now transmitting. You again stow your Micro using the exact same technique as when you first put it away. This time, however, the Micro will continue beeping because it is locked in search mode and receiving your partner's signal. You'll need to take it out of the harness, press and hold the Flag button for three seconds to unlock the search mode, and then return the transceiver to its harness. Yes, you could have avoided this by pressing the Flag button for three seconds after testing your partner's transceiver, but that seems like it defeats the concept of not requiring user intervention to change between searching and transmitting. Or maybe you turn on your transceiver and immediately begin searching for someone (maybe it was turned off because you were doing a different task or maybe because you turned it off to clear a previously flagged transceiver). If you inadvertently cover the proximity sensor with your thumb, it will switch to transmitting without any warning beeps. Here's a more serious oddity. If you turn on the Micro when it is in its harness, it will emit three extra beeps (I've seen people do this on several occasions without being aware of the extra beeps). If you then take the Micro out of its harness, the display will show "E7" (the font is less than 1/4" tall). In this case, even though you removed the Pieps Micro from its harness, it will not begin searching! You'll need to hold down the Flag button for three seconds to change to search mode. Okay, you say, don't turn on the beacon when it is in its harness. But the same thing will happen if you turn on the Micro and cover the proximity sensor with your thumb. The quirks continue. If you stow the Pieps Micro in a baggy pocket, the proximity sensor can incorrectly think the transceiver has be removed from its harness and it will begin searching. To avoid this, Pieps provides a small sack that you should store the Micro in if you don't use the factory harness. You are probably getting tired of my refrain, but the need for a sack seems like one more workaround that could have been avoided with a search/transmit switch. Here is another oddity, although this one is relatively minor. Many people learn that you can unmark a previously marked victim by quickly toggling from search, to transmit, and then back to search. Since this isn't possible on the Micro, you need to turn off and back on. And finally, the Micro's display provides minimal (and non-intuitive) indication on whether you are searching or sending—two blinking dashes means you are searching for a signal whereas a blinking X-like symbol means you are transmitting. Another non-intuitive indication that you are transmitting is a blinking orange LED inside the Micro's translucent case. Once the Micro switches from transmit to search mode, you will need to press and hold the Flag button for three seconds to unlock the search mode, and then stow the transceiver, to return to transmit mode. There is microprint on the face of the transceiver that says, "press 3s" (the text is ~1 mm tall). The text has a picture of a padlock, but it isn't near the Flag button that you need to press. 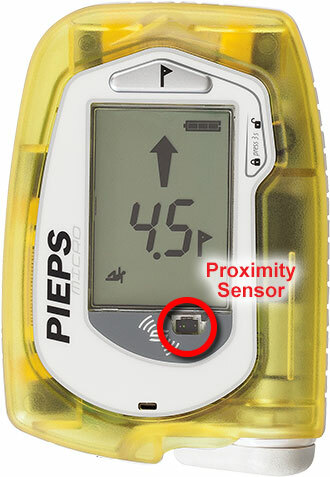 Pieps is a cutting-edge company that has made revolutionary improvements in avalanche safety gear (e.g., three antennas, marking of multiple burials, long reception ranges, an airbag with a fan, updates via Bluetooth, etc), but I think the proximity sensor creates far more confusion than having a physical switch. It is truly a shame, because the Pieps DSP Sport and DSP Pro have the simplest user interface of all: one clearly labeled switch that changes between off, send, and search. With practice, many people will be able to understand the behavior of the Micro's proximity sensor, but a switch would make that practice unnecessary. After pointing out the potential confusion created by the Micro's proximity sensor, here's the quick workaround: turn the transceiver off and then back on before stowing it in its harness and before searching. That won't make up for the lack of a switch, but it will avoid most of the oddities noted above. 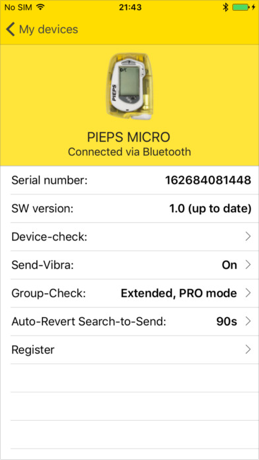 Customization: The Pieps Micro uses Bluetooth apps (for both Android and iOS) to perform a self test and to set several options. These options including turning the vibration on/off, setting the group check mode to extended or Pro, and setting the time before the Micro reverts to transmitting to either 60, 90, or 120 seconds. The apps also let you update the Micro's firmware. This approach is revolutionary! There is no need to visit a store, or ship your transceiver, to update its firmware. Upgrades: As mentioned, above, the Pieps app lets you update the Micro's firmware using a smartphone. Battery Status: As with the DSP Sport/Pro, the battery status is displayed as an icon that is either empty, 1/3, 2/3, or full. We strongly prefer displaying the battery status as a percentage as per the older DSP transceivers. The user's manual says that when the Micro displays 1/3 charged, it can transmit from between 20 and 100 hours—that seems like a ridiculously imprecise range. Comfort: The Pieps Micro is small and light—no doubt about it. The unit itself is ~30% smaller than the already tiny Tracker3 and ~60% smaller than the Pieps Sport. Including the weight of the harness, the Micro is ~33% lighter than the Tracker3 and ~40% lighter than the Pieps Sport. The Pieps Micro snaps into a unique skeletal-like bracket rather than using a more traditional pouch-style harness. This results in a light harness, but it also makes it a little difficult to extract the transceiver (one of my smaller ski partners couldn't remove the Micro from its bracket without practice and a struggle). The skeletal frame has a double-headed arrow that implies you can rotate it in either direction to remove it from the bracket, but it reality the transceiver must be rotated clockwise to be installed and counterclockwise to be extracted. As with the Pieps DSP Sport and DSP Pro, the Micro's leash extends on an elastic cord. User Manual: The Micro includes a minimalist user manual. A more extensive manual is available online. Warranty: The Micro comes with a two-year warranty. My Pieps representative tells me that registering the Micro extends the warranty to five years, the Micro's warranty card states that registering extends the warranty to four years, and after I registered my Micro the app shows the total length of the warranty as three years. Despite the contradictions, I suspect the Micro's warranty is similar to the other Pieps products: a two-year warranty that extends to five years when registered. Other: Starting with version 2.6, the Micro supports a mobile beacon park using the Pieps App and Pieps TrainingPads. The Micro's display is large—approximately 25% larger than the Powder/Recon and Pro/Guide. Pros: Small and light. Excellent perpendicular reception range. Cons: A proximity sensor that creates more problems than it solves.